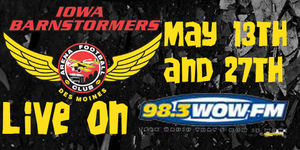 DES MOINES – The Iowa Barnstormers in cooperation with Citadel Broadcasting of Des Moines have announced this morning that two of their upcoming games will be moved to WOW-FM 98.3 due to scheduling conflicts. The games that will be affected are Friday, May 13 at Jacksonville and Friday, May 27 vs. Utah. All remaining games will continue to air on the Barnstormers flagship station, AM 1700 the Champ. Fans don’t forget that the game originally scheduled for this Friday night in Dallas, has been moved to Saturday, May 7. The scheduling change is a result of an arena scheduling conflict with the ongoing NBA Playoffs. Kickoff for Saturday night’s game will remain at 7:30p.m. The game can be heard live on AM 1700 the Champ with Larry Cotlar handling the play-by-play duties. The game can also be seen live on Nifty-TV, and as always the Barnstormers road game watch party will be taking place at Bennigan’s, located at 1810 Army Post Road in Des Moines.